Back in my day, I learned classic children’s songs by wearing out video tapes and cassette tapes and following along with the picture books. It’s a lot more streamlined nowadays–not to mention a lot less wear ‘n tear–with the advent of the iPhone. Genera Interactive takes advantage of this with their education app, Kids Song Machine. With the use of a touch-sensitive screen Kids Song Machine gives the classics an updated look and feel. Tap the blue gear to change songs, once the song gets going, your child can have fun tapping all around the screen to figure out which characters can move. And of course, this being a music-based app, the music is excellently recorded. The voices sound like kids, but are good enough to accurately portray correct pitch and tempo. My only quibble is that a lot of the environments and interactive bits really had no relation to the song playing. This pushes the song to more of a background music feel, rather than something to be learned and remembered…especially when the sound effects overwhelm the actual song; it’s then that I can hardly concentrate on the song, let along a four-year-old child. Kids Song Machine includes six classic songs for $1.99, so give it a chance; who knows, your kid could be the next big thing. 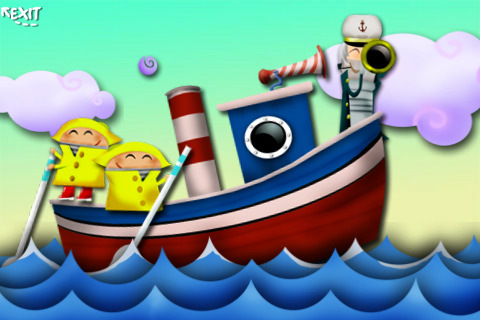 AppSafari review of Kids Song Machine was written by Julie Guan on March 11th, 2010 and categorized under App Store, Education, Fun, Music. Page viewed 4864 times, 1 so far today. Need help on using these apps? Please read the Help Page.